The's a story in everything, a spilt second of seeing something and just your imagination ... I try write stories in my other blog so if your want to pop over there your most welcome. I wish I lived in a little home just like this one. 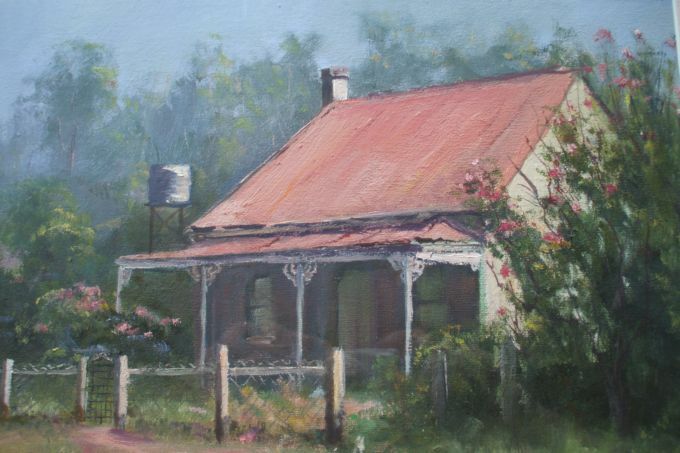 How would you describe living in the past in this lovely cottage, the roof has faded to a dusty pink. A garden full of beautiful flowers and railing out the front. Maybe a pretty pink banksia rose climbing over a hedge at the back. Somewhere inside the smell of homemade scones being servied with a little strawberry jam and cream. I know I fell in love with this painting and had to buy it. 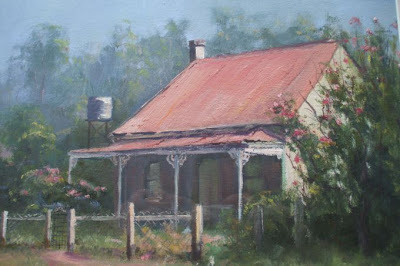 The artist is Mrs Carmel Busfield from Sydney. To my great supprise I found an email from Mrs Carmel Busfield Wow can you believe that! Telling me she saw her painting on my blog. First thing I thought maybe she might not be so happy about that, but then it's so pretty. So I email her back and asking if that alright with her. I am still pinching myself, what are the chances of such a lovely artist reading my blog and finding her painting there. I hope we could maybe someday meet for cup of tea and maybe share that scones, jam and cream. How fun to have heard from the artist. I agree it is a beautiful painting! That is incredible!! I love the painting and yes, we are all still here. Big surprise. Wow Rina thats just lovely that she actually mailed you. Maybe she could tell you where that little cottage is and you can go and have a look at the real thing. Well thanks to Mrs. Carmel Busfield and to you, Rina! I think you might be having a tea party soon and I just wish I was close enough to attend! I can almost smell the strawberries and cream right now. You are so lucky to have found this treasure of a painting! How cool is that? It truly is a beautiful painting!